Bonaire Blennies, August 2013 ~ We are starting this page with the blennies we saw fairly regularly in Bonaire in September 2013. 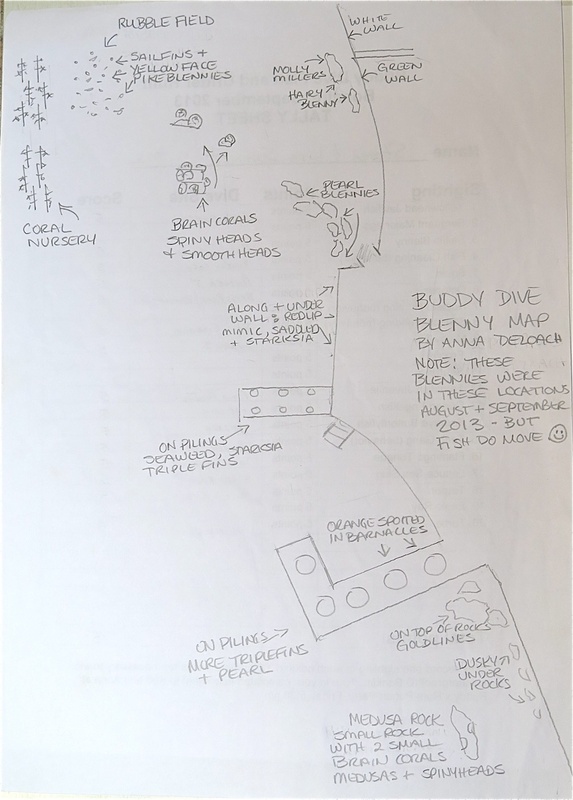 Below the photos are descriptions for each fish and two sketched maps of where we found them. Check back here because we’ll be updating it during our September 2014 stay. 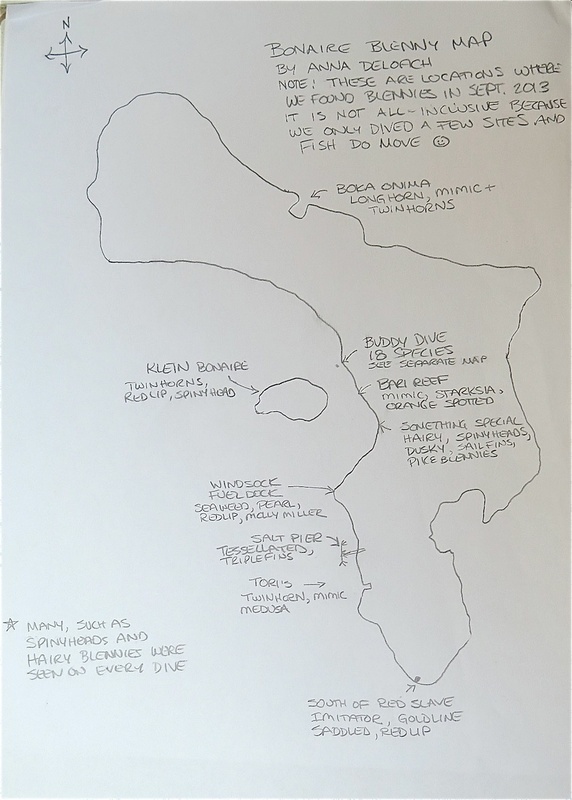 This is a work in progress and the information will change as we explore different dive sites. Check out the latest edition of Ned and Paul’s book. 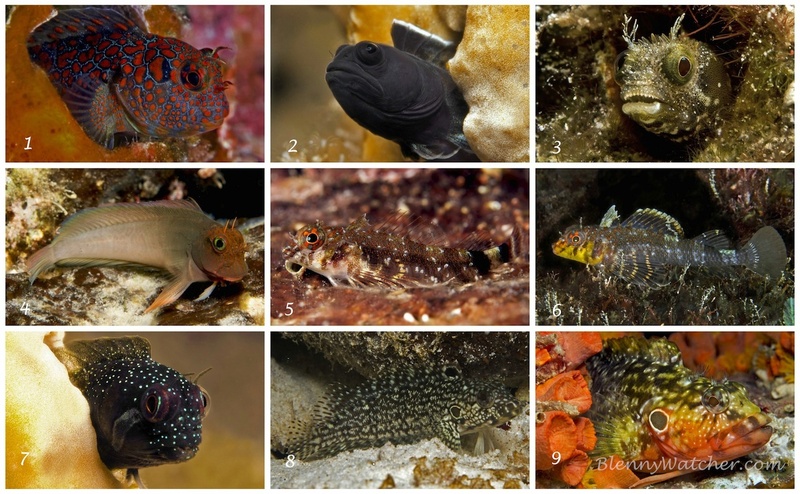 Just published in May 2014, the 4th edition of Reef Fish Identification contains a number of updates regarding blenny identification, accompanied by many new photos. A comparison of two similarly appearing fishes: The Orangespotted and Tessellated blennies. 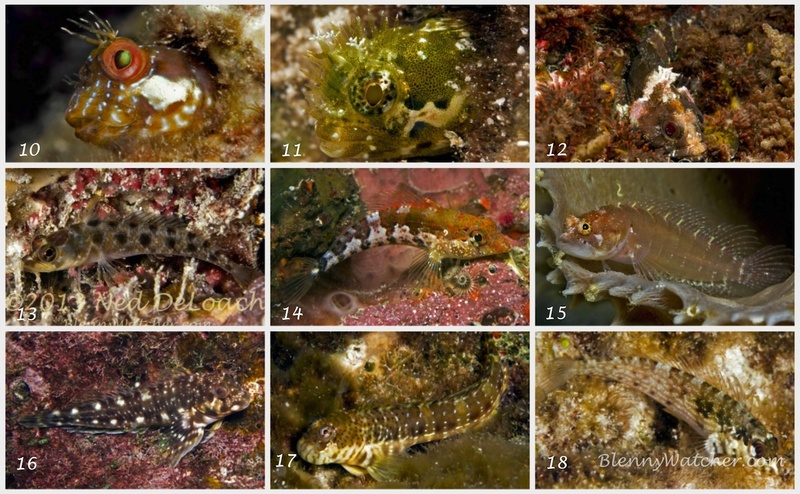 Close-ups of Spinyhead and Medusa blennies. One of my all-time favorite blenny portraits, Ned captures a Smoothead Glass Blenny rotating its eyes completely backward. A visit to the “Wildside” of Bonaire resulted in a two-hour dive in the surge, but we got the Longhorn Blenny. 1. Tessellated Blenny – We found these in empty barnacle shells on pilings of several piers, including the Salt Pier, where they were very shallow. 4. 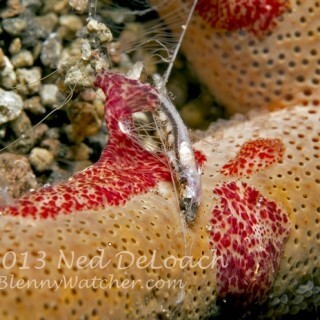 Redlip Blenny – The second most common blenny we see. We tend to see them in the shallows (above 3 m). 5. Two-bar Triplefin – These guys are everywhere but ww see them sot often in shallow rocks and pier pilings. We were honored that Dr. Ben Victor named this fish for us (Enneanectes deloachorum). 6. Two-bar Triplefin, nuptial male – Imagine the thrill when we found this male in its nuptial colors! 9. Hairy Blenny, nuptial male – All three of the nuptial males in the Hairy Blenny complex can take on the zebra coloration – or not. 10. 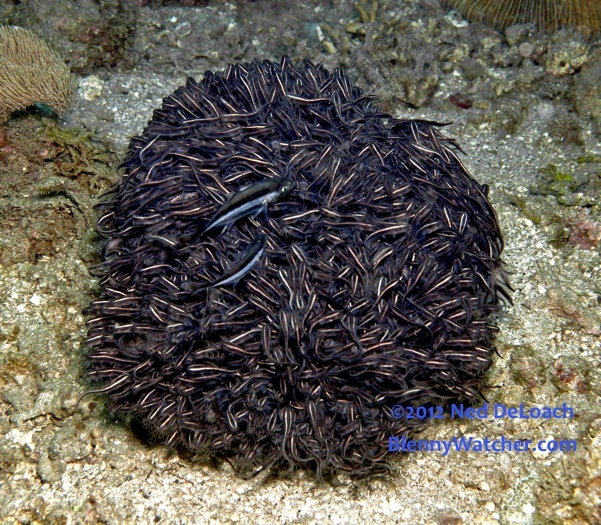 Seaweed Blenny – Of all the Caribbean blennies, the Seaweed Blenny seems to have the most varied appearances. 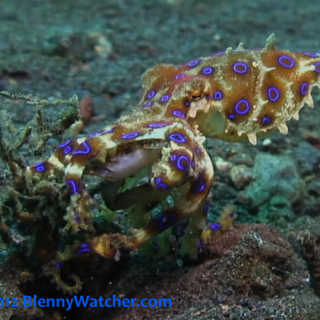 The ones on Bonaire are very colorful. 11. Medusa Blenny – If you see what you think is a Spinyhead with a particularly fuzzy head, or what you think is a Secretary (which are not found on Bonaire), you have likely found a Medusa Blenny. We find them in the shallows – in the same habitat where we find true Secretary. 12. Mimic Blenny – Every time we find an unusual blenny on Bonaire and cannot identify it, we send it out to scientist friends and it always comes back as a “Mimic Blenny”, so these fish live up to their name. 14. Saddled Blenny – Another fairly common species found in shallow areas, usually at the base of a small coral head. 15. 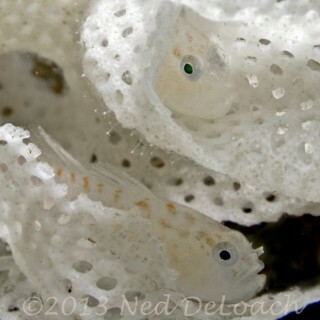 Ringed Shy Blenny – We almost always find these tiny fish peeking over the edge of a tube sponge. See note about shy blenny complexes above. This one is in the Ringed Shy Blenny Complex. 16. Molly Miller – Found along many rocky shorelines and pier pilings from the Salt Pier to Sabadego. 17. Pearl Blenny – These are fast and darting, but will pause occasionally to give you a look at the their distinctive, bulbous face. Found along shallow, rocky areas. 18. Goldline Blenny – I have seen these everywhere, usually in areas of hardpan bottom with little washed-out hiding holes. 19. Yellowface Pikeblenny – Found in rubbly, sandy areas off the reef, in relatively surge-free zones. 20. Sailfin Blenny – Found in similar habitats to that of the pikeblennies. Sailfins are easiest to spot when males display by darting up a few inches from their shelter tubes, displaying their large dorsal fins. 21. Longhorn Blenny – We have only found these in the channel at Boka Onima, but there were so many that I have to believe they are everywhere on that side of the island.